Guess who took me fishing this evening? I don't have a fishing license so I couldn't actually fish, but I was perfectly content to hang out on the shore, take some pictures, watch the sun go down, get some work done for a meeting I have tomorrow and contemplate the meaning of life while Bruce played in the water. My night in one word? Perfect. Check Another One Off The List! I just got home from another on call - I had a busy afternoon, but relatively quiet night until 3:45 a.m. when I shot awake to the sound of a code blue. Not the most pleasant sound to wake up to! I was going to come home and go for a run, but the humidity level is like 150% and I'm exhausted. It's back to bed for this chaplain! I have been trying really hard not to. I really, really have been. Tomorrow marks two more weeks until CPE is over. Can you believe it? It seems like just yesterday I spent my first day on the floor, contemplating how in the world I could quit CPE and still manage to be ordained. I believe I sent Bruce a text around noon that day, which said: "I will be home around 10:00 tonight. At that point I will need to cry." And now I see light at the end of the tunnel. It's weird. I'm trying not to count down the days for several reasons. First of all, I need to stay focused at the task at hand. I need to be a chaplain. I have two more on calls and I am going to need to be especially present and focused during those times. The spiritual needs of patients, families and staff won't decrease just because I only have a few days left. Second of all, I haven't fully come to terms with the fact that come August 14th, I won't really have anything to do. The last seven years of my life have been structured by my education. During the year my focus was school. During the summer my focus was work or internships. Now my job is to finish working through my ordination process and start looking for a job. Unfortunately, it's not a simple or a fast process. So there is definitely an in between time of waiting, being patient and trusting the process. Easier said than done. I don't do well without structure in my life. 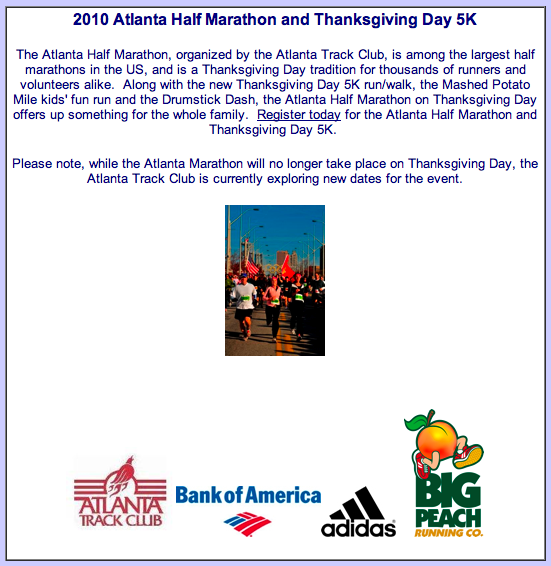 ... the Thanksgiving Day Atlanta Half Marathon. What do you guys think? Should I go for it and start training? The way I see it, registering for a half marathon would accomplish two things. One, it would give me a tangible goal that I can be in control of. Two, it would give me an outlet to deal with the anxiety that comes with looking for a job. My only concern is that I still don't have any cartilage in my right knee - but I'm fairly confident that I can slowly build up my miles and strengthen my legs so I'm not pounding on my knees. 13.1 miles is kind of daunting considering the fact I haven't run more than a mile and a half in over three years - but I think it might actually be fun to create a training schedule and trust a different kind of process. Should I do it? Any Atlantans want to do it with me? The fan has been running a lot (sometimes when I only have one or two programs up) and it's been getting very hot and causing the battery to drain. When the fan really gets going sometimes it runs a little slowly and it won't shut down normally. Initial tests at the apple store showed nothing wrong with the fan OR battery. I'm thinking it's a hardware problem? Or a software problem? I'm going to have to send it out, but I wanted to back everything before I did that so I still have it. Birthday Snow With Lilly from Sarah Weaver on Vimeo. So apparently people were having issues opening my blog and having a Twitter thing pop up? I'm not sure what the issue is, but I pulled my Twitter gadget until I can get on my computer and investigate further! I'm guessing it's just a glitch with the gadget but who knows if it's permanent. 1. It's another skirt from high school! I fully intend on wearing these 10-year-old skirts until someone tells me to stop. 2. 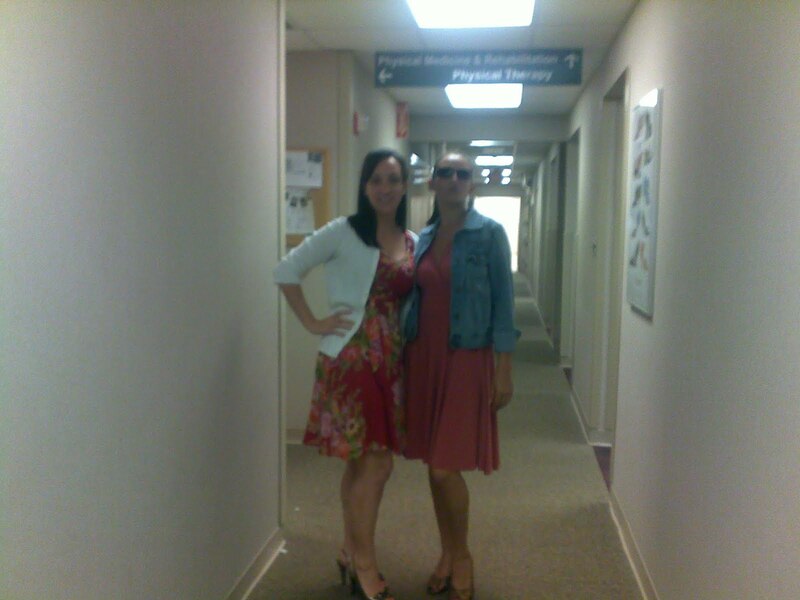 One of my fellow interns had the same skirt in college! She is three years older than me so her college years match up with my high school years. When I walked into group this morning she was like, "That was one of my favorite skirts!" We had a WADT bonding moment, it was nice. 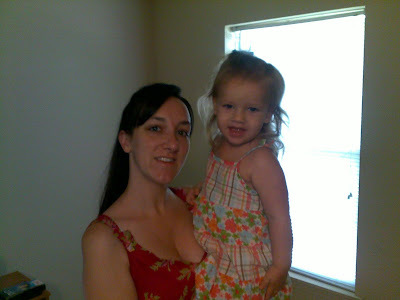 Christen and her beautiful daughter! Both in dresses - I love it! Christen with one of her coworkers. She works in a hospital, too! She convinced a friend of hers (who lives in another part of north Georgia) to take part in WADT, too! I love the way social media is spreading the good news that is WADT. Meet Betsy. Betsy is a friend of Kari's from med school. Kari did not participate in WADT this week (she gave me some lame-o excuse about being on her ED rotation and having to wear scrubs) but Betsy's current rotation allowed for participation! I love the angle that she took this picture from. I may steal it next week. Sara! She posted a couple more pictures today and they are so beautiful! Speaking of Sara - she suggested a couple of days ago that the WADT button link directly to a page about WADT. I finally managed to create a page for it, which you can either find linked on my left sidebar or up on my top navigation bar. I updated the button so now it will link directly to that page. If you get a chance, just re-copy the code. Thanks! So Bruce was out of town this weekend visiting his family. He flew out Friday morning, but because I was on call Thursday night and didn't get home until 9:30 Friday morning, I had to say goodbye to him when I left for work on Thursday. I know there are worse things to go through than being apart from your husband for five days - in fact I see a lot of them at hospital. But, still - I missed him. And I realized once again just how lucky I am. Let's back up. On Friday night I was driving home from a fundraiser at the church when I noticed my car was bobbling on the highway. And not in the "it's windy so I just need to keep two hands on the wheel" kind of way. It was bobbling in the "hmm my tire feels like it might fly off" kind of way. I didn't really feel safe making the 45 minute trip home from church, let alone the 2 hour trip to Alabama I had planned for Saturday. So I called Bruce. At 12:30 in the morning. Sobbing. I'm not sure what I expected him to do from 800 miles away, but what I did do was manage to upset and worry him because his wife was six states away freaking out, but still planning a road trip with a car that needed work. I'll spare you the details but we hung up around 1:30 and went to bed. At 6:30 the next morning he sent me a text saying he had talked to the manager of the service department at the dealership he works at and they were expecting me to stop by to have them fix my car on my way out of town. I arrived at the dealership at 8:30. The guy who Bruce said was expecting me stopped what he was doing, took my car and an hour later I was on the road again, this time with correctly balanced tires - and feeling much safer! So it's been awhile since I've posted a recipe - but, let's face it, it's hot. I've been eating a lot of yogurt, peanut butter and jelly and ice lately. Start by boiling your chicken. While everything is cooking, wash and chop your vegetables. Start building your salad. Let the rice simmer for 20 minutes and add it to the top. If I only have one piece of chicken I usually throw it in the water first, then turn the rice on and take the chicken out when the rice is done (about 25 minutes between boiling and simmering) so I know it's had plenty of time to cook. Chop up the chicken (for this salad I actually only used half of this piece). Add the chicken and try not to drool as this all comes together. Walnuts are expensive. However - this brand was cheaper than the store brand. Ahhhh, yes. The ultimate cake salad topper. What do you all think of my new design? I'll probably tweak it a little over the next couple of days, but it was definitely time for something new! I don't really have much to say today. I woke up with a nagging headache, which only got worse as the day went on. 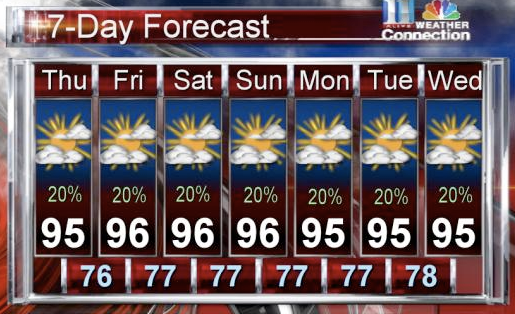 I blame the "toasty forecast" (the meteorologists words, not mine), so I've been trying to just lay low and drink as much water as possible. I was definitely feeling the hike in my muscles this morning. We didn't actually intend to hike far - but got a little turned around and ended up hiking out a mile or two and then having to backtrack to the waterfalls. I found the entire situation to be hysterical and when we finally got to the waterfall, the water felt even more refreshing! Anyway, I hope everyone had a wonderful weekend. For those of you who were born and raised in this south and are used to dealing with these heinously hot summers - do you have any tips for a northerner who currently wants to find a way to attach herself to her AC vent? Have you ever floated at the bottom of a waterfall and let the water coming down the falls massage your neck and shoulders? You should. It's incredible. I'll be back with more details tomorrow - but for now I'm sunburned, sore and ready to crawl into bed. Have a good night! My goodness - usually after a night on call, I'm on here much quicker than this! That being said ... I survived another night on call! In the grand scheme of things, the night really wasn't that bad (although, I did call Bruce crying after I finished up with one family - have I mentioned how wonderful he has been this summer?). I came home and immediately changed and took a walk. The heat index was supposed to be well over 100 today and I wanted to get out and back before it at least hit 90. I had some errands to run afterwards, but have pretty much been hanging out at home trying not to melt ever since! I'm heading to church soon for a fundraiser - I can't wait, all of the weekend on calls have kept me from church and I miss everyone! I realized this week that I had only used one and a half of my five comp days for the summers - three and a half left! I looked at my schedule and figured out when I could take off. One of those days is this Monday (! ), so (including my recovery day today) I have myself a nice four day weekend! I definitely need it. I plan on trying to find the perfect balance between productive cleaning and lazy relaxing. TGIF everyone! First weekend in weeks I'm not on call - YAY! Have I ever mentioned that when Bruce and I met he didn't like cats? For the record, Lilly came into my life about a month before Bruce did. And she never lets him forget it. It's Wear a Dress Tuesday! I know I probably seem insane for wearing a dress with 3/4-length sleeves in the middle of an Atlanta summer, but this dress is actually really lightweight (and I spend most of my days in the air conditioning anyway!). 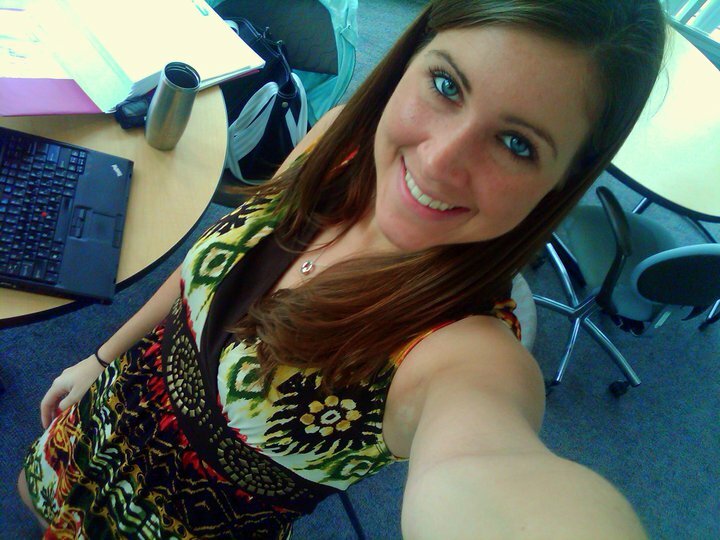 Who else wore a dress today? 1. I try to eat as healthy as possible, but every now and then the Hungarian in me kicks in and I cook with bacon zsír. Translation - bacon fat. Please don't judge me. 2. When I listen to showtunes, nine times out of ten I conduct along. 3. I am brand loyal when it comes to four things - toyota cars, apple computers, canon cameras and jif peanut butter. Everything else is fair game. 4. I think earrings are the perfect accessory. They are inexpensive, versatile and never make you look fat. 5. I'm something of a fashion chameleon. On any given day you can find me in business attire and boots, jeans and flip flops, a dress and heals, leggings and flats or running clothes and sneakers. 6. I love pilates, but have never really shown any interest in yoga. 7. I have a secret crush on Leroy Gethro Gibbs. Apparently it's not a secret anymore. 8. I don't believe in paying full price for clothing. 9. When I was in 2nd grade I played Cinderella in our class play. 10. I am an introvert on Myers Briggs. Most people are shocked when they find this out. 11. My favorite genre of books is memoirs. I love reading people's stories. 12. I don't like wearing my glasses. My eye doctor practically has to beg me to give my eyes a break from contacts. 13. My mom is a pastor. So was my great grandfather. 14. My goal for my last semester of college was to spend as much time with my girlfriends as possible before we all graduated and parted ways. Two weeks before the semester started I met the man who would eventually become my husband. 15. My approach to living in my faith is very similar to my approach to learning how to cook: Tabula Rasa - every day you wake up with a fresh start to try again. I love the television show Friends. I watched it religiously when it aired, own all 10 seasons on DVD and turn it on if I can't fall asleep at night. That being said ... I think Friends gave me an unrealistic picture of life in your mid twenties. Think about it - the show consisted of six friends in their mid (to eventually late) twenties who lived in apartments much bigger than mine, spent most of their day sipping lattes in a coffee shop, ate out a lot and took fantastic vacations almost every year. Now let's talk about MY mid twenties. I have spent the last seven years at two very expensive schools, only to have to graduate and have to do a craaaaaaaazy intense internship (unpaid where I actually owe tuition!). I haven't been on a real vacation in three years and my passport is collecting dust. I spent last night clipping coupons (which is totally another post for another day) and drove to three different stores today while grocery shopping to try to find the best deals. I was pondering my life this afternoon and called my parents to explain to them that Friends had lied and no one had properly prepared me for my twenties. They were at the Grand Canyon yesterday and today. When I called them they were attending a photography workshop. A PHOTOGRAPHY WORKSHOP. AT the Grand Canyon. Where the instructor taught and then sent them out to practice what they learned. Using the Grand Canyon as a subject/background. To say that I'm jealous is an understatement. When I told my dad I was jealous (okay, okay, maybe I was whining), he responded with, "Hey, I'm 56 years old!" I cannot wait until I'm 56 years old. 56 will be my reward for making it through 25. Kari's back in town. She has some sort of test to take tomorrow that is required for all med students and only administered in five cities in the country, Atlanta being one of them. When I got home from the hospital this morning, Bruce and Kari told me they were heading to the gym to play racquetball if I wanted to join them (either to play or just work out). Kari told me I should try to get some pictures of them playing, so I grabbed my camera on my way out the door, not really sure how to even attempt action photography in a glass box under fluorescent lights. It was a noteworthy attempt. I started off outside of the court. I figured, after all, that the court is enclosed for a reason. Bringing an extremely expensive camera into one probably isn't the smartest idea. But then I reviewed my first couple of photos and realized that the entire gym was reflected in the glass. Yuck. So - against my better judgment - I went in. I still wasn't happy with the photos I was taking. I didn't have enough light, so my shutter speed was too slow and I was getting blurry arms and legs. So I did something that I NEVER do. I turned on my flash. I ended up with less blurred photos, but I still wasn't happy with the way they were lit. I need an external flash. So then I changed lenses, figuring I could get more light with my 50 mm lens, a lens that allows for a wider aperture (aperture is the circle in the lens that allows light through - the wider the opening, the more light allowed in). Eh. Bruce still has a blurry arm. I started to get frustrated. 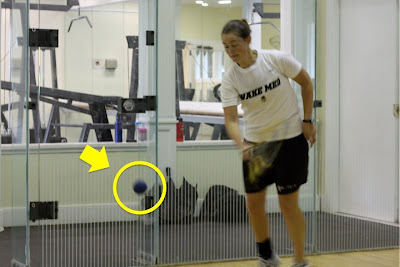 It was at this point that I thought perhaps I should just call a spade a spade, admit that there is no good way to shoot the game of racquetball and get the heck out of the court before I (or even worse - my camera) got hit by the ball. I had a feeling I was already pushing my luck. Then I took this picture. Look carefully at this picture. Notice anything? If you're wondering if that ball hit me or my camera the answer is yes and yes. Which leads me to two points. 1. Keep a UV filter on your lenses at all times. My lens took a direct hit and doesn't have so much of a scratch on it. 2. Trust your instinct. If your instinct says, "Maybe you should leave this racquetball court before you get hit by a ball" - you probably should. Actually, come to think of it, you probably just shouldn't go into a racquetball court while a game is going on unless you're actually playing in the game. This post can probably be safely filed under, "Way to state the obvious". p.s. Does anyone else play racquetball? It's actually a really fun game. I get super competitive when Bruce and I play. One time I missed a point, threw my racquet across the court and cursed, to which Bruce replied, "Sarah! You're going to be a pastor!" I survived another 26 hour on call! Man - I don't know how these residents have done this all year. Thank you, thank you, thank you to everyone who commented and sent messages after my last post about dreams. It is helpful not only to be told that I'm not crazy for having strange dreams (or at least that I'm not alone), but also to know that I've got such a wonderful community of people supporting me and praying for me on this journey. The worst part about Saturday on calls is that they are looooooooooooooong. The best part is that when you leave on Sunday you have all of Sunday to recover and then Monday off as well (as opposed to Sunday on calls when you leave Monday, have the day to recover and then have to be back on Tuesday). So I'm off to be completely lazy (and totally proud to admit it, ha). Have a wonderful Sunday! I've always thought that dreams were more of a thermometer than a thermostat - they don't predict what is going to happen, but they are a pretty good indicator of what is going on. When I first started CPE, I had a feeling that the experience was going to be similar to what I imagined it would be like to run a marathon. There would be times when I would love it, there would be times when I would hate it, there would be times when I would be running on adrenaline and there would be times when I was just completely exhausted. I would be happy when it was over, but also happy that I did it. The other night I had a dream that I was running a marathon. In the dream I was refusing to look down at my watch, not wanting to know how long I had been running (subsequently knowing how much time I had left to run). I was having a great time, really getting into my groove and feeling like time (and miles) were ticking by when I decided I would look at my watch. In my dream I thought that I would have been running at least for 3 hours (if I were to train, I could probably run a marathon in 4 hours). I looked at my watch. I had been running for 30 minutes. For some reason, that dream really freaked me out - but I think it rings true about where I am in CPE right now. The first couple of weeks were filled with orienting myself to the process, being scared of on calls and dealing with what all of my new experiences meant. Every day there was something new and something to break up the day. The time flew by. Now I'm into it. I've seen a lot of truly horrific things. I have sat with individuals and families during tragedies and traumas. If you had told me about some of calls I've been on before I started, I wouldn't have believed you. It's starting to wear on me. In addition to the marathon dream, I've had weird medical dreams. Sometimes they pertain to me, but sometimes my friends and families are in them as well. They are weird and unsettling and I don't like them. I feel like time is starting to drag - and every time I look at my calendar I feel like I did in the dream when I looked down at my watch in the marathon. I'm not as far along as I feel like I am. It's frustrating and hard and making me anxious. I don't want to go into "survival mode" but I feel like that's where I am right now. I hesitate to post this, because I don't want it to seem like a pity party and I don't want people to worry about me and think I'm falling off the deep end - but I do want to be honest about how I'm feeling. I'm in the middle of an intense program and it's not easy. My reactions are normal and there is an end in sight. I would love any prayers as I turn the corner and finish out the summer (hopefully!) strong. Hey - at least I didn't make HER wear a dress! I have a huge pile of clean laundry that needs to be dealt with so this is going to be short - it's amazing how quickly an afternoon/evening can go by (and how little I actually get done) when I'm attached to my computer! It felt amaaaaaaazing to sleep in today! I didn't even set an alarm(!). Last week I had to turn in a Mid-Unit Evaluation to my CPE supervisor and talk about it with my peer group. There were certain questions I needed to answer, so I thought it might be fun to write a mid-unit evaluation that a little less topic-restricted for the blog. - I really like continual ministry and hate that in hospital chaplaincy there is often not a lot of relationship building and follow-up. Usually I'm thrown into someone's life during a really traumatic time and it's hard to know things about them that might be important and helpful as I offer care. There's a lot of 'making it up as I go along' - though I suppose that's ministry in general. I hate that once patients and their families leave the hospital, I don't know what happens. I know that ministry isn't about me and my sense of closure, but that's where I'm at right now. - I much prefer the day-to-day rather than being on call. I hate the isolation of an OC shift. Even during the day when I'm still making calls by myself, there is still that safety net of knowing I could call someone in if I needed them - and knowing that as soon as the call is over I can go back to the lounge and process with someone else. Being alone is scary and I don't like it. - On a similar note, I can never fully 'relax' when I am on call. In the back of my mind, I am always anticipating the pager going off. I wish I could just shut that anticipation off and simply jump into chaplain mode when I need to - but I haven't figured out how to do that, yet. - There needs to be a required course on humility in college. For the past six weeks, I have made mistakes, gotten lost around the hospital and fumbled through calls. I was hard on myself and frantic when that happened. I wonder if any of this would have been different if I hadn't convinced myself that I HAD to have all of the answers right away and just asked more questions. Let's face it - no one is perfect. Let's not pretend we are or (even worse) that we have to be. - I still love my peer group. They are phenomenal chaplains and I am grateful for the lessons they are teaching me - both about ministry and about myself. - My supervisor rocks. I wish that every single person who reads my blog had someone so incredibly insightful to advise them. - The other day my clinical supervisor asked me if I wanted to apply for residency at Grady for the upcoming year (meaning I would start the Monday after I finished my internship). I'm not going to lie - I considered it. I already know the system, it would give me some more time with my ordination process and even though the salary isn't a lot, it would still be more than I am used to making. I talked to Bruce about it and he looked at me like I was crazy. I talked to my dad about it and he said, "Don't you want to find a nice church somewhere?" I stopped considering it. Then I talked to some of the other interns about it and they all indicated they were considering applying for residencies after they finished seminary. Then I started considering it again. Then I started thinking about WHY I was considering it. And I came to a very important conclusion: I am considering it because I am a people pleaser. I want to be good at everything I do. I don't want to admit that - while I may be a competent and even somewhat good chaplain - I just don't like it enough to want to do it full time for a year. Ugh. Then I started to get angry at myself because I don't like admitting defeat - and in my mind, not loving chaplaincy enough to want to do it for another year is defeat. THEN (wow, this is a long thought) I realized something important - something very, very important. I am going to be a phenomenal church pastor - that is what I feel called to do, that is what I am trained to do and that is where my heart is. And that's okay. 42 days down, 32 to go! If you want to read all of my CPE-tagged posts, click here. My recovery day is almost over, so I'm going to shut down, put away some laundry and spend time with my wonderful husband before I crawl into bed. Have a good night and sweet dreams! I survived my 26 hour Saturday on call! The day itself was fairly quiet - I had a few calls, but nothing that took very long. I decided around 11:30 that I was going to go to bed, started to drift off around midnight and my pager went off at 12:15. Of course. I made my way to the call, which lasted around 45 minutes. By the time I got back to the lounge, logged the call and settled myself down it was 1:30. I fell asleep and was dreaming soundly when I was jolted awake by the pager at 4:15. This call lasted around an hour and a half, so I got back and napped for about an hour before it was time to wake up and get ready for the Sunday chaplain to arrive. So I think collectively I might have gotten around four hours of sleep (which was fairly normal for me in college - how did I ever do that?!). I couldn't leave the hospital until after the 9:30 worship service, which meant I was on the road around 10:10. I flew home, changed my clothes and Bruce and I headed up to church for an 11:15 meeting. By the time I got home at 2:00 I was sooooo tired but also equally hungry (I had only eaten a granola bar all day even with the calls in the middle of the night) so I made lunch and then crashed for two hours on the couch in front of the World Cup. It felt so nice to sink into my own couch without a pager right next to my ear! We have pretty much spent the afternoon and evening relaxing and cleaning. A friend of mine came over tonight and we baked a delicious fruit pie (recipe and pictures to come!) and now we're watching NCIS reruns and blogging (yes, Bruce's blog is up and functional! - I'm still fighting with the layout so I'll share the link soon, I promise). It really was the perfect way to spend a post-call day. One of the nice things about being on call on Saturday is that your "recovery" day is Monday. So even though I was technically recovering today, I still have tomorrow! I plan on watching the Today Show and drinking coffee in bed, doing enough pilates until the muscles I don't know I have hurt and catching up on some blogging and blog reading. Come back tomorrow and I might have more than the ramblings of an overtired chaplain, ha. Raspberry, Mango and Passion Fruit Sorbet covered in White Chocolate drizzled with Chocolate. I'm on call tomorrow - 8 a.m. Saturday through 10 a.m. Sunday (yes, if you do the math that's 26 hours ... I try not to do the math) - say a prayer for me! First of all - you all rock. Thanks for the messages and sweet words yesterday. I am feeling so much better today. It's amazing what a good night's sleep and conversation, reflection and processing with my peer group can do. Oh - and barbeque. The other interns and I decided we deserved it and stopped for lunch after our group meeting. Yesterday was our HALFWAY POINT! 37 days down, 37 to go. Actually, today it is 38 days down, 36 to go. I cannot believe it - this program is really flying by. I had planned on doing a "halfway" post yesterday, but then the day happened and I just didn't feel like writing much. I'll try to do one this weekend - it'll be fun to look at my "initial thoughts" from six weeks ago. This is going to be quick, because I'm hoping to get a second good night's sleep, but please pray for my Aunt Jane. My parents were having a family picnic last weekend for the holiday and they had to bring her to do the hospital with severe stomach pain/attacks. They thought she had appendicitis, but it ended up being some other strange lower gastro-intestinal thing. She had surgery on Sunday and has been in the hospital ever since. Her recovery has been slower than they hoped and I know she is frustrated. My uncle is still staying with my parents (they live four hours away) and I cannot imagine how hard it is for him to be back and forth from an unknown house to an unknown hospital. I am not going to lie - I had a terrible day. I got in my car to drive home and made it as far as the highway (probably a mile and a half from the hospital) before I burst into tears. I cried the entire way home, immediately changed into workout clothes and took a looooooooooooong walk while listening to the Wicked soundtrack. That helped. You know what also helped? Looking at this picture. The botanical garden has an edible garden in one section that showcases how to grow different produce specifically in the Atlanta climate. There are signs everywhere telling people not to pick/eat the food and at one point I wondered out loud what happened to the food. Then I saw this sign. So - yes. My day sucked. I wish I could talk about it. But I can't. So for now I am grateful for simple reminders that good things are happening in the world. I am also grateful for my friends and family - both in real life and in the blog world. You all are amazing. It's WADT! Today I wore one of my 'finds' from this weekend's shopping extravaganza. This dress was originally priced at $60 and I paid $15. Fantastic. I'm still going through some of my pictures from the weekend. I really can't believe that I waited so long to go to the Atlanta Botanical Garden. I cannot imagine how beautiful it must be during the spring and I cannot wait to check it out in the fall! A dragonfly! He/She stayed absolutely still for a good 45 seconds while I took pictures. So cooperative! One of the friends I was with explained to me that bugs are drawn to the little knob on the top of these plants. When they land, the plant itself is really slippery, so they slide down and then the plants eat them! It's kind of neat and kind of horrifying all at the same time. I love this picture. It's simple and fresh. Straight out of camera. Beautiful. So today I was called up to my floor to do an anointing with a patient and his fiance. An anointing is really just a blessing or a healing ritual. We have oil that we use and then each chaplain can do what they feel comfortable based on their own tradition and the specific situation they are being called to. Today I spent a lot of time talking to the patient before I actually did anything. We read a psalm together and then talked about it. When we finished our conversation, I picked up the bottle with the oil in it and took out the cork out. I put my thumb over the top, turned the bottle over to dip my thumb in the oil and proceeded to pour oil all the way down my arm. Apparently my thumb is smaller than the top of the bottle. I am an awesome chaplain, I really am. On Friday night, Bruce and I went over to our friends' house for dessert and scrabble (this is where the 'Fury' photo came from). I don't think we have seen them since graduation and we seriously needed some time to catch up! They are expecting their first baby at the end of August (!!) and I couldn't be more happy for them - they are going to be incredible parents. Saturday morning we woke up and did some much needed cleaning around the apartment. I feel like we need to vacuum twice a week in order to keep up with the dirt, dust, cat fur and hair that collects around here! I wouldn't mind, but Lilly absolutely hates the vacuum and every time we turn it on she is traumatized for a good hour and a half and we have to bribe her with treats to come out from under the couch. Anyway, around 10:30 Kari got here! Kari had called me last week and said she had a three day weekend from the hospital (she's a 4th year medical student at Wake Forest in North Carolina) and wanted to get out of town. We didn't have any plans so I told her to come down and we'd celebrate the U.S.A. right. I'm sure you're thinking to yourself, "How do you celebrate the U.S.A. right?" Well, I'm glad you asked. We did three things. ... this was the damage. Impressive, no? I'm happy to say that I didn't buy anything at full price and spent no more than $12 on anything! ... 50% off Vera Bradley aprons! Safely filed under "Well, it was my own dumb fault". Anyway, this will lead to more economic stimulation. Because I now need a new tablespoon measuring spoon. And will most likely find some other sort of kitchen gadget that I never knew I needed when I set out to purchase a replacement. "Sarah Weaver - Pulling this country out of its recession, one ruined-by-hot-bacon-grease-tablespoon at a time." 2. Tailgating, baseball and fireworks. In that order. ... and I put my feet up and drank a Diet Coke. The game was fun (even if the results were less than desirable). Our seats were awesome! We root-root-rooted for the home team and when they didn't win it was a shame. I cried. Is it normal to cry over a large flag? Does patriotism increase with age? I don't think I've ever cried over the singing of The Star Spangled Banner before. After the game we moved up into the upper deck behind home plate so we could get a better view of the fireworks. Look at that beautiful skyline. I love my city. Bruce and me waiting for the fireworks to start! I was getting impatient. At one point we could see three fireworks shows going on. The show on the field, the ones from Centennial Olympic Park and the ones at Stone Mountain. How cool! 3. Tourist attractions. The kind that involve backpacks and cameras. I had today off from the hospital (I needed the three day weekend!) so Kari and I made plans with some friends of ours for lunch. When we were looking at the map to figure out how to get to the restaurant, we realized that the Atlanta Botanical Garden was right down the street and convinced ourselves that we HAD to go! The garden is BEAUTIFUL! Words really don't describe it. They had different exhibits with all different kinds of climates and agriculture. I think I'll upload my photos to flickr so if you want to click over and see them all you can. I took this picture of my reflection in a lilly pond. I want to go back! I am absolutely exhausted (and kind of broke!) but the weekend was totally worth it! Travel safe to everyone still making their way home!